On looking back, I see that I first wrote this series of articles about four years ago. Time goes by so quickly and I felt compelled to introduce to (hopefully) a new audience what, for me, is a romantic and poignant true life story. Somewhere in a quiet churchyard in Gravesend, on the south bank of the River Thames, lie the remains of a young woman called Rebecca Rolfe. Gravesend dates back to ancient times. It has its own entry in the Domesday Book, where it was recorded that ‘[t]here is a church , and 1 hithe’. The Roman-built Watling Street passes nearby. The town acquired new prestige as a port during England’s wars with France in the fourteenth century, and was once sacked by the French in reprisal for English raids on the Continent. By the beginning of the seventeenth it was already first port of call for vessels arriving in the Thames, including tobacco traders bound for London. The present-day church of St George was built only in 1732, but it replaced a mediaeval one destroyed by fire only a few years before. The last resting place of Rebecca Rolfe, according to the parish register, was in a vault under the chancel of the original building. Though attempts to discover it have been unsuccessful, visitors can see all around reminders of this woman who, for a single short year, was the talk of all England and was even presented at the royal court. These reminders include two stained-glass memorial windows, a dedicated plaque and, outside in the pleasant garden, a larger-than-life bronze statue of her, a replica of which stands on the shores of Chesapeake Bay in the State of Virginia, a mere hundred miles from Washington DC. The name Rebecca Rolfe is perhaps not one many people (in England anyway) will immediately recognise. Yet she is a legendary figure in the culture of both Europeans and North Americans. For four hundred years, historians and novelists alike have tried to tell her story but none has managed to tease out the whole truth from a maze of contradictory reports and diaries. She has become a figure of romance in books for children (and adults). Her treatment by Hollywood sparked indignation among her descendants and kin on two continents. She is the subject of many portraits. The girl who on her marriage became Mistress Rolfe is much better known by another name. The tale of which she is but a part is about colonisation, and ultimately exploitation, but also about endurance and – if we are to believe all – even compassion and bravery. When she was born in the New World in the last years of the sixteenth century she was given the name Matoaka (or Metoaka); when she died in England she was only twenty-two years old. 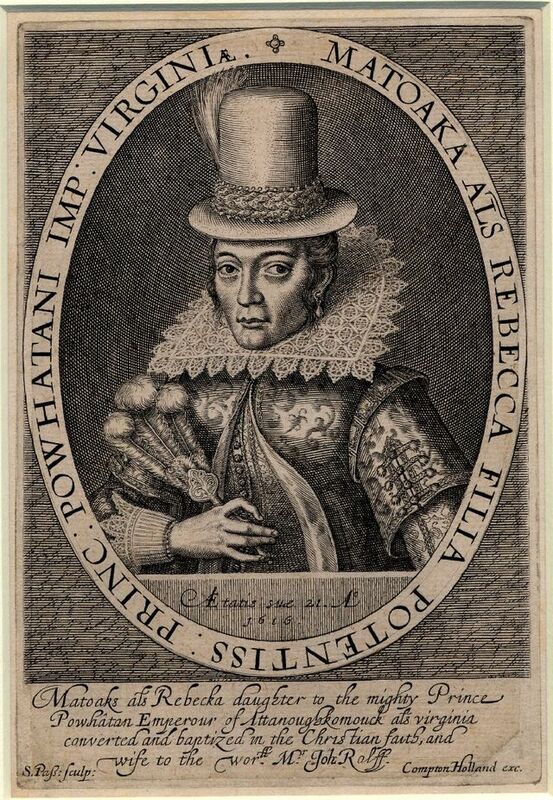 She was born around 1595, the daughter of Wahunsenacawh, king or supreme chief of the Powhatan Federation, a group of native American clans living and farming in the Chesapeake Bay area, between the James River and the Potomac. The world knows her today as Pocahontas. King James I, who ascended the throne of the united Great Britain in March 1603, was no less keen than his predecessor, Queen Elizabeth to establish a permanent colony in North America. In 1606, he granted a charter to the Virginia Company of London to realise this objective and in December of that year, a fleet of three ships, the Godspeed, the Discovery and the Susan Constant set out for North America under sealed orders. Aboard the Susan Constant, was a certain Captain John Smith, soldier of fortune, explorer and one-time trader, pirate and slave. Many historians disbelieve Smith’s account of the episode, which he embellished in a book published some seven years after the date of his letter. Others attempt to explain it symbolically. Whatever the truth, there can be no doubt that Smith was the man who, more than any other, was responsible for creating the Pocahontas legend. 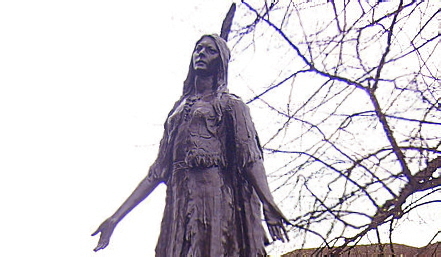 Matoaka became a regular visitor to Jamestown where, according to some versions of the story, she was held hostage for two years to maintain peace with the tribes. Perhaps out of curiosity, she began to learn more of the Europeans and their customs, thus paving the way for her assimilation and marriage to an Englishman. The story of Pocahontas saving John Smith is legendary here in the U.S., but the story ends with her sailing off to England with John Rolfe. I’ve never read anything about her time over there and look forward to your next post. Great research! Thank you! I hope you’ll enjoy the rest.